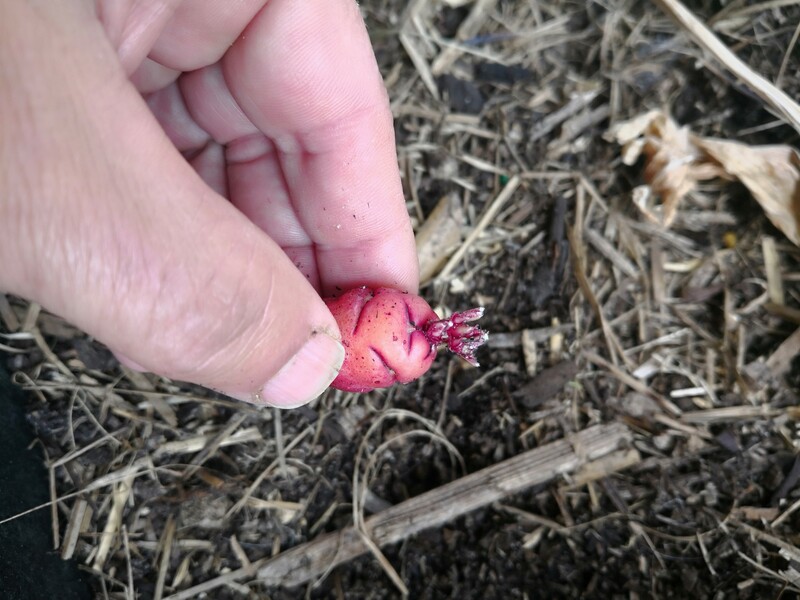 I haven’t had much luck growing Oka (Oxalis tuberosa also known as New Zealand Yams) in the past. It’s either been eaten by dogs (Charlie and Bronson both enjoyed digging them up and eating. Bless you boys, wherever you are), rotted from too much moisture or shrivelled from the opposite). This year I thought I’d give it another try so I ordered a bunch of tubers from Tassie through eBay. It’s been over a month since they were planted in groups in various micro-climates around the garden and I couldn’t resist rooting around to find one to see how they are going. The one I found is still plump and undamaged and has a little shoot popping out. Hooray, we might be successful this year!